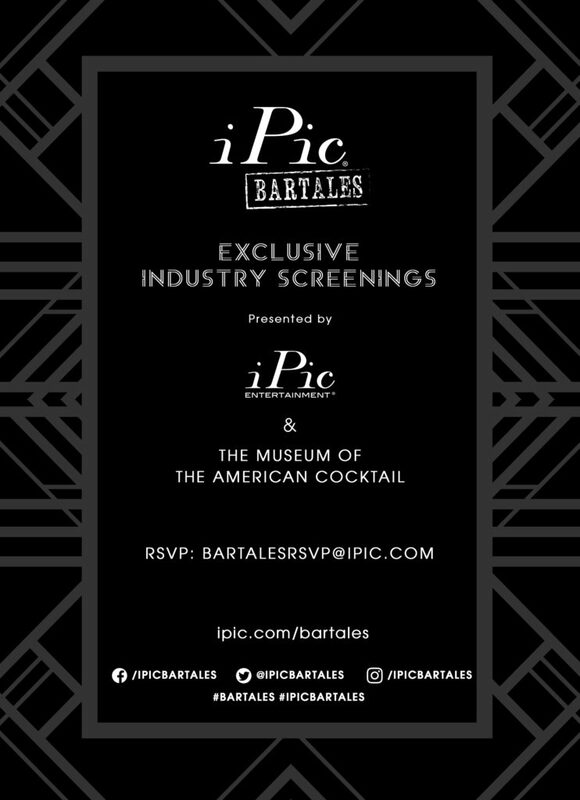 Following three months of private industry screenings in Los Angeles, New Orleans, Houston and Miami, BarTales New York will be revealed during an exclusive world premiere presented by iPic Entertainment and The Museum of the American Cocktail on October 17 at iPic Fulton Market from 6 – 8 p.m.
VICE TV’s Randy Foreman was hand-selected by Seger to direct and co-produce the film and capture the spirited conversation and magical energy created when DeGroff, Regan and Wondrich go on a two-day Uber Black-shuttled tour of New York’s most influential bars. The six vignettes are edited to live independently, but when watched sequentially they tell the tale of the evolution of New York bar and tavern culture. Says Seger, “The result is a cultural piece more about emotional connections and human conversation while what’s in the glass plays more of a supporting versus starring role.” A fringe benefit to this project with his mentors, James Beard-winning “King Cocktail” Dale DeGroff, multiple cocktail book author and legendary bartender Gary Regan and world-renowned cocktail historian and Esquire Magazine drinks columnist David Wondrich was Seger’s deepened knowledge and respect for the New York scene as Seger created his program for iPic Entertainment and The Tuck Room New York. New York’s world influence on cocktail culture started during the 19th Century days of Jerry Thomas’s bar at the P.T. Barnum Museum just blocks from the recently-opened iPic Fulton Market which inspired some of the best bartenders in the world to take their craft to London, Paris and Havana during Prohibition. Today’s most influential bars and bartenders in the world continue to be influenced by New York’s bar culture everywhere from Chicago to Singapore. “You can take virtually any city in the world with a strong cocktail culture and tie it back to some point in time where New York City influenced it. There’s such a rich history in this area, and we wanted to be sure to pay a huge amount of respect to that,” adds Seger. The October 17 world premiere of BarTales kicks off with a cocktail party at The Tuck Room followed by a private screening with curated cocktail pairings within iPic Theaters Fulton Market. Following the liquid history lesson, guests are encouraged to make a reservation at The Tuck Room for an immersive experience in understanding New York’s heavy influence on American cocktails and in turn, on the curation of Seger’s cocktail menu at The Tuck Room. During the screening, viewers will watch as Seger is joined on-screen by “the Godfathers” during a chronological presentation of their visits to these six distinguished bars and taverns across New York City. Selected based on their contributions to the American cocktail scene by the Godfathers themselves, the destinations and their accompanying visionaries include McSorley’s caretaker Matthew Maher, Genuine Liquorette’s creator Eben Freeman, Long Island Bar’s owner Toby Cecchini, Dead Rabbit co-founder Sean Muldoon, 21 Club GM Teddy Suric and Pegu Club’s legendary Audrey Saunders. Each establishment boasts a unique history that is uncovered as BarTales unfolds, delivered with captivating anecdotes, signature cocktails and a glimpse behind the bar at some of cocktail culture’s most influential personalities.